Some student names are more easily remembered than others. Most teachers have a few tricks up their sleeves for quickly learning student names. Some use association tricks such as “curly-haired Christy,” “glasses for Glenn,” and “Brian with a buzzcut.” These work well for remembering some student names, but not all. Desk tags are great too. 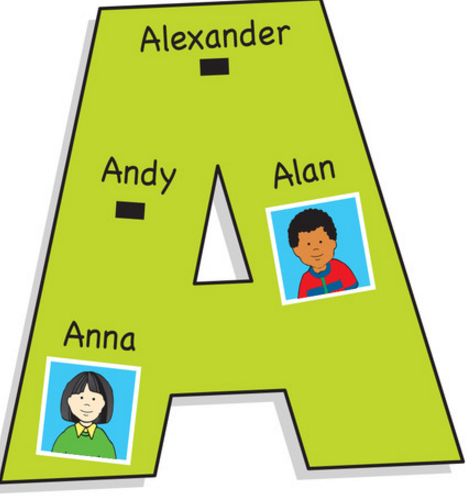 I ran across the idea of displaying super-size cutouts of the first letters in your students’ names and then programming the cutouts with student names and photos (or self-portraits) as shown. (Get DETAILS here.) I thought this was nifty because the cutouts are helpful to both the teacher and students. How do you quickly learn the names of your students? Or maybe you have a special teacher gene that just makes this happen? I do home visits to my students before school so I know many of them before they start.